Shaving is one way to remove public hair. For centuries, women have been grooming their pubic hair. Modern women have plenty of options when it comes to methods and designs for grooming this delicate area. If you don't want to spend the money and endure the pain that goes with waxing at a salon, you can still create designs like a landing strip, diamond or heart at home with the help of stencils. Trim your pubic hair, if needed. It makes the entire process much easier if hair you'll be shaving is trimmed to about 1/4 inch. Place the stencil against your pubic hair, holding it in place with one hand. Hold the stencil pencil (or colored lip pencil) in your other hand, using it to trace the outline of the design. Pull the stencil away and make sure you can see the shape outlined. Apply a thin layer of clear shaving gel to your pubic hair. Pull the skin taut and start shaving from the outer area toward the pencil line. You goal is to leave pubic hair in the design you chose and remove the excess pubic hair outside the outline. Continue around the design and apply more gel if needed. 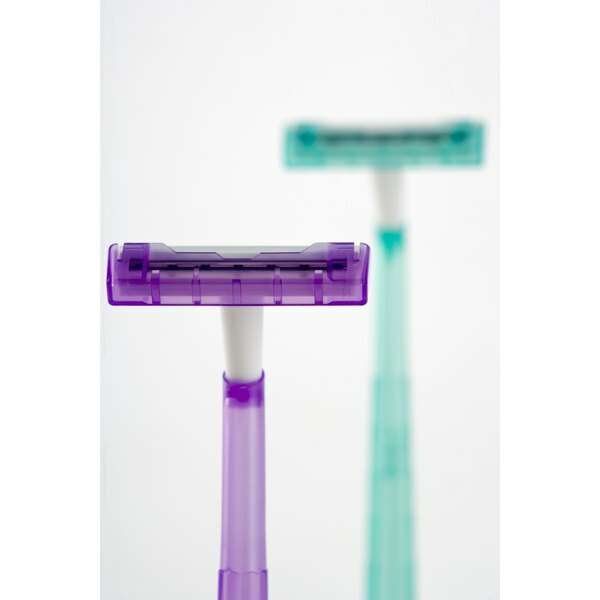 Rinse your razor several times during shaving to get the smoothest, cleanest look. Use a comb to pull the remaining hair within your design up and decide if it needs further trimming. Wash off shaving cream and the pencil outline. Apply an astringent formula that contains salicylic acid to prevent ingrown hairs, and moisturize the entire area. Every other day, look at your design using a mirror. Use a little shaving cream and a razor to shave away any hair stubble to make your design last. Take your time when shaving. Use a gentle soap when cleansing your pubic area after creating your design. If you are not confident about creating a design on your own, ask your partner to help you. Always use a new blade when creating your design. Never use a dull blade when shaving. Never use hair removal cream on your pubic hair area. Use firm but gentle strokes when shaving. Avoid scraping your skin.